The BetMcLean League Cup. Pic by PressEye Ltd.
Officials have confirmed fresh plans for Tuesday’s scheduled BetMcLean League Cup semi-final ties. 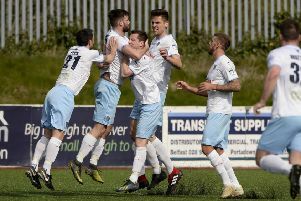 A statement released by the Northern Ireland Football League has confirmed a decision to postpone the game between Ballymena United and Cliftonville. A review is planned for Tuesday morning over the suitability of Dungannon Swifts’ Stangmore Park for the match with Crusaders. The Ballymena Showgrounds semi-final has been rescheduled for Tuesday, January 16. “Having consulted with the League Cup committee with both clubs, the NI Football League regrettably have taken the decision to postpone the BetMcLean League Cup semi-final between Ballymena United and Cliftonville scheduled for Tuesday 12 December,” confirmed a NIFL statement. “The decision was taken in light of the adverse weather conditions and the interest in supporter and player safety. “This game will now be played on Tuesday 16 January 2018. Portadown’s Bluefin Sport Championship game against Dergview could take place on Tuesday, December 19 - with alternative dates across December 22 or 23. Following a weekend postponement at Shamrock Park it was hoped to rearrange the game for this week but talks continue.